The nine-day festival will feature more than 120 films from 29 countries, along with a variety of educational forums, director interviews, and celebratory events. The festival kicks off May 7 with "UC in Effect! "-a program featuring short films by four UCSC students that begins at 5:15 p.m. at the Del Mar Theater-prior to the opening night feature-length selection, Gospel Hill. UCSC film alums Mo Perkins and Tamara Maloney will return to Santa Cruz on Thursday, May 14, for the screening of their first feature film, A Quiet Little Marriage, at 6:30 p.m., at the Regal Cinemas Riverfront Stadium. Winner of the 2009 Slamdance Film Festival's Grand Jury Award in the Narrative Competition, A Quiet Little Marriage is a story of deception, and the gradual unraveling of a young couple's seemingly perfect relationship. The film, which has been receiving considerable buzz, stars actors Cy Carter and Mary Elizabeth Ellis (of TV's It's Always Sunny in Philadelphia) and runs 88 minutes. A Quiet Little Marriage will screen along with Sculpey the Slug by UCSC students Jennifer Kehl and Doug Smith-an animated tale of claymation about Sculpey the Slug "who finds and loses love.and finds it again-sort of." UCSC alumnus Tony Gault's Fossil Light (11 minutes) screens on Tuesday, May 12, at the Riverfront Twin Theater as part of a program featuring short environmental films. Gault documents an "eco-tourist" photo safari where amateur photographers track endangered polar bears along the shores of Hudson Bay. Closing night, May 15, features UCSC alumnus Harrod Blank's film Automorphosis, a 77-minute look at a group of eccentrics, visionaries, and average folks who have transformed their automobiles into artworks. The film screens at 7:30 p.m. at the Veterans Hall. 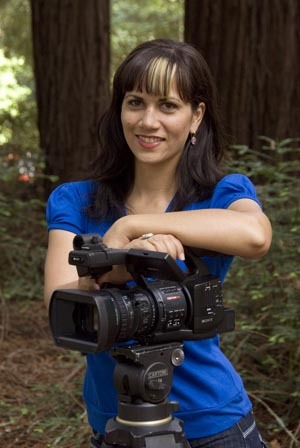 "We are so pleased to see our alumni garnering recognition beyond UCSC for the incredible work they produced here, and to see them continuing their filmmaking work after graduation in such a highly accomplished manner," said Shelley Stamp, chair of the UCSC Film and Digital Media Department. "It's especially gratifying to see that the friendship Mo Perkins and Tamara Maloney began as UCSC students-over a decade ago-is not only still thriving, but also producing a remarkable collaboration like A Quiet Little Marriage." For more information about the Santa Cruz Film Festival, go to SC Film Fest.